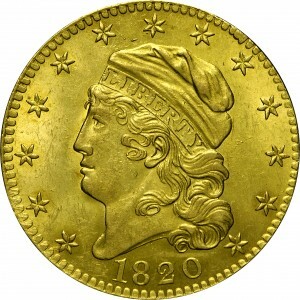 Walter Breen organized the half eagles of 1820 in three different groups or types. This provides a first step in attribution and verification of known varieties. 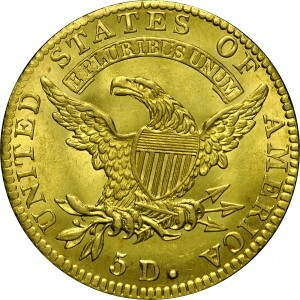 This example belongs to his group, with a squared-base 2 in the date and large letters on the reverse. Examples of this group are also displayed at HBCC-3134, 3136, and 3141. These four coins were struck from three different obverse dies. 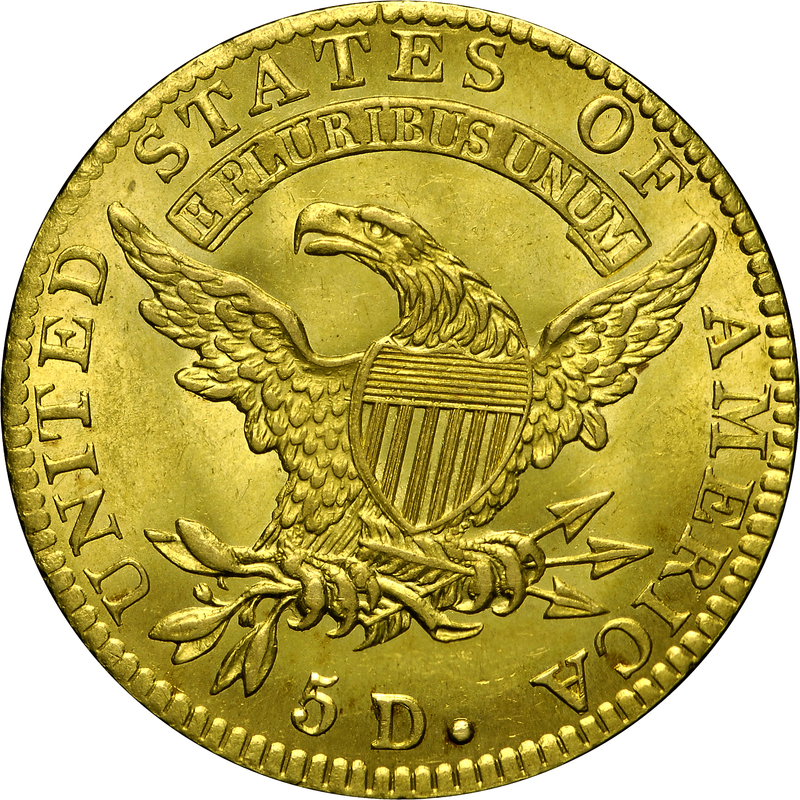 This obverse is quickly recognized by the group of three merged dentils at 1:00. Note the relationship of the first S in STATES on the reverse of this example as compared to HBCC-3134. From Stack's sale of the Alto Collection, December 1970, Lot 135. 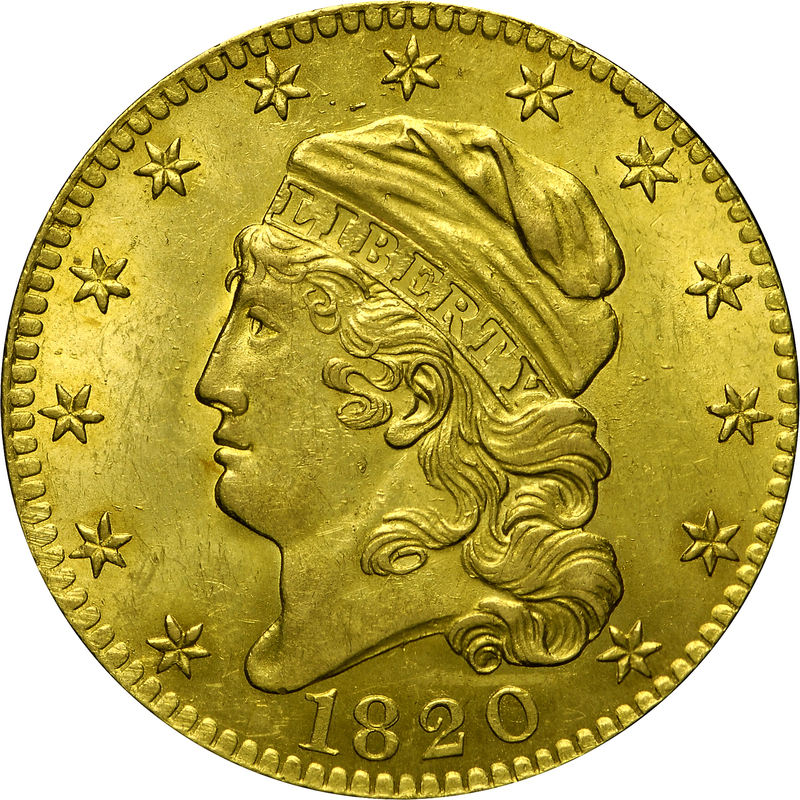 "Obverse: Flat-based 2. Symmetrical 8. Interior of 0 ovate. Star 1 less than its own diameter away from bust (distinctive). Small curl a bit left of being centered over 0. Star 13 has point all but touching hair (distinctive); and has about half to left of an imaginary line drawn from back of cap to back of hair. Minute die center punch in front of ear. Rust lumps above cap between stars 6 and 7; between cap and star 11. Lapping has removed most clash evidence within RT and behind hair opposite star 12. Reverse: Large letters. 'Punched' T (letter T has a triangular punch in bottom of upright. Used in other years.). S over E and space right. T over R and space right. S over US. Base of E high to that of adjacent T. Perfect M. Fairly close 5D, top of 5 markedly higher than that of D. Large period."